Our Outdoor Stove with Stand is one of our best sellers…and for good reason! Two high-output burners give you anywhere from 5,000 to 35,000 BTUs per burner. This means your stove has the finesse to cook 2 eggs over easy at the campsite, or the power to cook a pot of chili at the local cook-off! 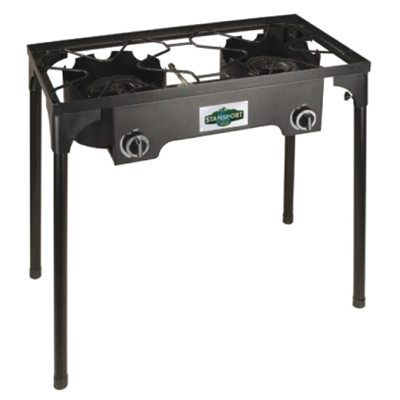 Our heavy-duty, free-standing, steel frame design gives you enough room for 2 full size pots or pans. Propane Canister Mountain House Classic Assortment Bucket Coffee Pot - 8 Cup Propane Appliance Hose - 5 Ft.